Limited 29 CD box set. 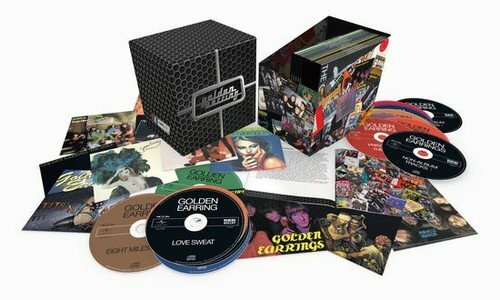 From their debut Just Ear-rings from 1965 till the tribute to their hometown The Hague from 2015 - all 26 studio albums by Holland's most legendary rock band are collected in a monumental box Complete Studio Recordings, augmented with no less than three CD's full of non-album tracks. Throughout the years Golden Earring released no less than 26 studio albums. Next to that, dozens of songs were released but not on official albums (the so called non-album tracks), including classics like 'That Day', 'Sound Of The Screaming Day', 'Another 45 Miles', 'Holy Holy Life' and hard to find songs, like 'So You Want To Be A Rock'n'Roll Star' / 'L.A. Woman' and 'You Gun My Love'. In total no less than 307 songs, that for the first time are compiled in this box set Complete Studio Recordings, including extended liner notes per album by respected music journalist Tjerk Lammers. So turn the volume up to 11 and hear how a little beat band from The Hague turned into the biggest and best Dutch rock band ever! If you have any questions about this product by Red Bullet, contact us by completing and submitting the form below. If you are looking for a specif part number, please include it with your message.